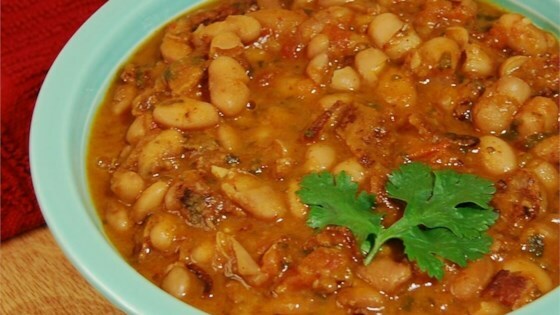 "Pinto beans are simmered with onion, tomatoes, chili powder, cumin and garlic. I love making these beans just because they make the whole house smell so good, and the longer they simmer the better they taste. You could add 1/2 can of beer to make 'borracho' beans. I personally taste-test throughout the entire cooking process and add extra seasoning as I feel it needs it. These beans could simmer all day long; just make sure they have plenty of water to keep the beans covered." Place pinto beans into a large pot and pour in enough water to cover by 2 to 3 inches. Let beans soak overnight. Drain beans, return to pot, and pour in fresh water to cover; add diced tomatoes, bacon, onion, chili powder, cumin, and garlic powder. Bring to a boil, reduce heat to low, and simmer for 3 hours. Stir cilantro and salt into bean mixture; simmer until beans are soft, about 1 more hour. This was okay. It wasn't as flavourful as I would like, and I couldn't really taste the bacon. Plus the beans were still kind of hard. excellent recipe! The only thing i changed was i used chicken broth instead of water and cooked the beans in a crock pot all day. Thanks for the great addition to my recipe collection.